This Accented Titanium Wedding Ring has the natural titanium color on the beveled edges that surround the CZ accented center old Plated ring. 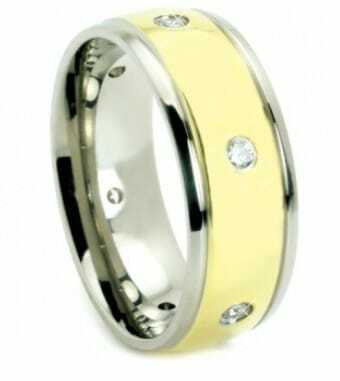 The Accented Titanium Wedding Ring comes in an 8mm width and in sizes 9 or 10. To learn more about custom jewelry click HERE. Click HERE for another Accented Titanium Wedding Ring design or to contact us with your idea for a Custom Men’s Wedding Ring. We would love to design your dream wedding ring if you can’t find exactly what you want. All of our “Contemporary Metals” wedding rings such as this Accented Titanium Wedding Ring are only able to be modified to suit your taste if recreated in a traditional metal such as Gold, Palladium, Platinum, or Silver. Titanium, Cobalt, Stainless Steel, Zirconium, and Tungsten are industrial metals that can’t work in unless making a bulk order. As with almost every jeweler selling these types of rings, they aren’t custom made and are purchased from Asian manufacturers, so the designs can’t be modified or customized.